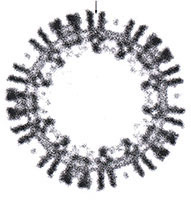 Nigel Unwin became a staff scientist at the LMB in 1968, after obtaining his Ph.D. from Cambridge University. He left the Laboratory in 1980 to become Professor of Cell Biology at Stanford University, California, and returned in 1988. In 1992 he became Head of the Neurobiology Division, followed by a position as Joint Head of Neurobiology Division from 2003 until 2008. Nigel has been interested in developing electron microscopical methods and using them to analyse the structures of proteins in membranes. In 1975, together with Richard Henderson, he determined the first structure of an integral membrane protein: bacteriorhodopsin. More recently, his research has focussed on the structure of the nicotinic acetylcholine receptor - the ligand-gated ion channel at the nerve-muscle synapse - and how it responds to acetycholine released into the synaptic cleft. He obtained an atomic model of this ion channel, in its native membrane setting, in 2005. The nicotinic acetylcholine receptor, at the nerve-muscle synapse, is a heteropentameric ion channel that has been fine-tuned through evolution to transduce a chemical signal into an electrical signal with remarkable efficiency and speed. Our research aims to understand how this protein functions so effectively by imaging the receptors in Torpedo postsynaptic membranes and using an acetylcholine spray-freeze-trapping technique to capture the transient open-channel form. 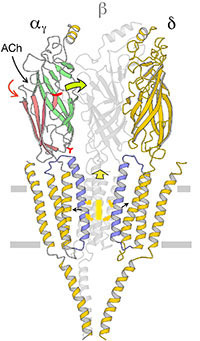 Comparison of the structures of the receptor in both open- and closed-channel forms has illuminated directly the mechanism of channel opening. All five subunits participate in a concerted conformational change communicating the effect of acetylcholine binding to the distant gate, but three of them (αγ, β and δ) play a dominant role. 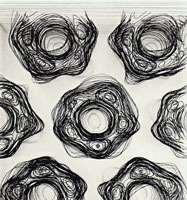 Flexing of oppositely facing pore-lining α-helices is the principal motion determining the closed/open state of the pore. Only very small displacements are involved throughout the whole protein assembly, explaining how the transition is so fast. The lipid bilayer also plays a vital, but poorly understood role in facilitating this conformational change. Currently, we are exploring the role of specific lipids by determining how they are organised in relation to the functioning channels. Nicotinic acetylcholine receptor and the structural basis of neuromuscular transmission: insights from Torpedo postsynaptic membranes. Refined structure of the nicotinic acetylcholine receptor at 4Å resolution. Structure and gating mechanism of the acetylcholine receptor pore.